UNISEC has received 500,000 Yen (about 4800$) of donation from Avon Products, Inc, a leading cosmetic company. 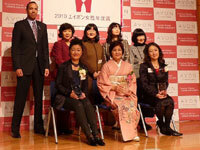 As Ms. Akiko Otsuka, Engineering Manager of Space & Satellite Systems Department, Space Systems Division of NEC Corporation was awarded an Avon Annual Women's Prize 2010 including 500,000 Yen as prize money to donate to any group/association of her choice, she had chosen UNISEC as her donee. Ms. Otsuka has been working for aerospace research and development for more than 20 years and especially known of her powerful involvement in development of 'Japanese-made' Robotic Arms which has been put into actual use on KIBO, the Japanese Experiment Module of JAXA, which was highly acclaimed by Avon. Professor Shinichi Nakasuka, chairperson of UNISEC had attended the prize awarding ceremony of Ms. Otsuka on 18 November, 2010 and celebrated her accomplishment. It is honor for UNISEC to be recognized as an important organization and to receive the precious support from Avon Products, Inc, and Ms. Otsuka to implement students-driven space development projects. We wish Ms. Otsuka further success and being an inspiration for UNISEC members. 10.12.10 UNISEC office has just moved to a new location. ARLISS 2010 was held in Nevada, US. CanSat Leader Training Program will be held from Feb-March, 2011. Application form for CanSat Leader Training Program is now available. 10.11.05 The 9th UNISEC Workshop Website open. The 9th UNISEC Workshop will take place in Kagawa University on 11-12 December, 2010. 10.10.26 Call for papers from The 2nd Nano-Satellite Symposium in Tokyo! We are welcoming participants from around the globe! The event is set to include the following five sessions. UNISEC continues to act as the cosponsor for the 2nd Nano-Satellite Symposium as well as its inaugural event in June, 2010. APSCC 2010 (Asia-Pacific Satellite Communications Council) was held on 5 - 7 October at Shinjuku Hilton Hotel in Tokyo. 10.10.12 UNISON Web site open! UNISON, students organization of UNISEC has own website for promoting interchange and much more. Please visit UNISON Web site and take a look at their various activities. The 6th Noshiro Space Event took place on 19 - 22 August, 2010 in Noshiro city, Akita Prefecture at northern Japan. 10.09.20 SDF 2010 was completed successfully! Annual SDF (SPACE Development Forum) was successfully held on 18 - 19 September, 2010 at Takeda Hall, University of Tokyo. SDF was founded in 2003 for the purpose of providing University students an opportunity to learn wide range of matter regarding space development and its future. uKey to the Futurevwas the slogan of the 2010 SDF. 10.09.17 UNISEC has monthly eMagazine now! In order to communicate up-to-date reports of the UNISEC events, members activities, special interviews and much more, UNISEC launched periodic eMagazine (Japanese only) . If you wish to subscribe UNISEC eMagazine, please click below link and follow instruction. We are welcoming new subscribers!! 10.07.26 The 8th UNISEC annual general meeting was held. 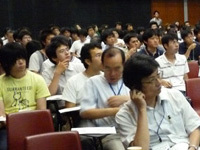 The 8th UNISEC annual general meeting was held at Takeda Hall in the University of Tokyo on 25 July, 2010. We were pleased to obtain a successful general meeting with 197 UNISEC members in total (148 students and 49 non students NPO member ) gathered at Takeda Science Hall. The launch of the 17th H-IIA rocket machine that had been scheduled on Tuesday, May 18 was postponed. The schedule for next time becomes 6:58:22, May 21, 2010. The 1st Nano-Satellite Symposium will be held at Takeda Hall in University of Tokyo on June,10-11. 10.3.4 "UNITEC-1" launch date set! The launch time and day of the H-IIA Launch Vehicle No. 17 (H-IIA F17) has been set for 6:44:14 a.m. on May 18. UNITEC-1 will be carried by the H-IIA with the Venus Climate Orbiter "AKATSUKI," the Small Solar Power Sail Demonstrator "IKAROS," and three other nano-satellites of Waseda Univ, Soka Univ and Kagoshima Univ.